Mint is still fine; CBD, not so much. A few months ago, I spoke to a reporter from Quartz about cannabidiol (CBD). She told me that a local cafe was offering a CBD-infused latte and that it piqued her interest for a story. Her local baristas were not alone as numerous bars, restaurants, and cafes across the country have been experimenting with CBD-infused beverages. However, as with all things CBD, the regulatory framework is rapidly changing. If you’re a business owner looking to add a CBD beverage to the menu, it’s important to carefully consider state and local law. That brings us to California. California is an excellent case study when it comes to CBD. The Golden State has a long history with cannabis, as it was the first state to create an affirmative defense for the medical use of marijuana in 1996. In 2016, California voters approved of recreational marijuana. California has also approved of an industrial hemp pilot program under the 2014 Farm Bill, but the program has been mostly dormant because the state’s laws and regulations make it nearly impossible to legally obtain hemp seeds. In addition, and perhaps most importantly when it comes to CBD, California has a propensity to regulate just about everything under the Sun. Cue the California Department of Public Health’s (CDPH) infamous FAQs. As we wrote back in July, these FAQs stated that CDPH was banning the inclusion of hemp-derived CBD as a food, food ingredient, food additive, or dietary supplement. 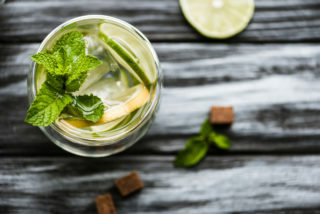 California’s Health and Safety Code defines food to include beverages meaning that CBD is not allowed in beverages of any kind. California’s Alcoholic Beverage Control (“ABC”) issued its own FAQs which stated that licensees could not serve alcoholic beverages mixed with cannabis, even if the licensee was using CBD. ABC cited to CDPH’s FAQs to prohibit the use of hemp-derived CBD. The FAQs are examples of CDPH and ABC using policy statements to enact what feels like a new law or regulation. At the state level, laws are passed by both branches of a state legislature and signed into effect by the Governor. Laws establish requirements or prohibitions. In turn, regulations are issued by agencies to clarify their interpretation of a law and how a law will be implemented. Like laws, regulations also impose requirements or prohibitions. When an agency issues a new regulation, there are procedural requirements such as a public comment period where stakeholders can voice concerns over proposed regulations. Similarly, when the legislature passes a new law, lawmakers hold public hearings. These procedural requirements provide for transparency. Agencies also can issue guidance or other policy statements to clarify how an agency understands and implements existing laws and regulations. Generally speaking, guidance and other policy statements are not mandates but rather are an expression by the agency of a suggested or recommended action. Agencies are not generally required to provide the public with a notice and comment period before issuing a policy statement because those statements shouldn’t establish requirements or prohibitions. When it comes to CBD-infused products, the outright prohibition in California is stated in the CDPH’s policy statement. There is no law or regulation that specifically prohibits using industrial hemp derived CBD as a food additive but CDPH interprets its governing rules and regulations to prohibit CBD in food or drinks. That last phrase, “regardless of source,” encompasses cannabinoids like CBD even if it was derived from industrial hemp. California has codified the prohibition of CBD-infused alcoholic beverages. The similar prohibition on CBD in non-alcoholic beverages and other consumable products is not codified in a law or regulation. In that sense, the latter prohibition would be easier to reverse. That said, CDPH’s guidance is powerful as agencies are given broad deference when interpreting their own regulations, so if CDPH changes that guidance, it will likely be because it wants to or because the legislature writes a law to expressly allow CBD in non-alcoholic beverages and other consumables. It will not be the result of a private party lawsuit. The idea of offering a CBD-infused cocktail in California is a non-starter. If you are hoping to enjoy a CBD cocktail, you’ll have to forgo California and book a flight east. CNBC reports a New York bar is experimenting with CBD cocktails. Perhaps New York regulators will take a different approach from their California counterparts. Time will tell. In a move that will likely come as a surprise to many, the Food and Drug Administration (FDA) has granted Breakthrough Therapy status to psilocybin, which is the psychedelic ingredient found in magic mushrooms. The Breakthrough Therapy status was granted for the use of psilocybin to treat depression. The move comes after research commissioned by the government found that the substance shows great promise in the treatment of depression. The designation of Breakthrough Therapy allows the FDA to expedite research and review of treatments containing psilocybin (or psilocybin itself). Currently a Phase IIb trial is underway attempting to determine the optimal dose range for psilocybin to treat severe treatment-resistant depression. The FDA’s Breakthrough Therapy designation was created in 2012, and was designed to give certain substances a faster pathway to approval. The post FDA Grants “Breakthrough Therapy” Status for Magic Mushrooms to Treat Depression appeared first on TheJointBlog.